A study shows a reduction of the stress hormone. Overall, the cortisol levels of the participants were reduced by an average of 23.7 percent. Regular use of Laminine contributes to reduced stress beginning 12 days of intake. Laminine is ideal for people working in a highly stressed environment and recommended for children’s mental focus and acuity. This food supplement may also help with depression by increasing serotonin levels (happy hormones). According to nutritionist and biochemist Dr. Rena Davis, “We do explain (to her patients) that this is a protein supplement that helps the body cope with stress and pain and sleep. That it also assist the body in the absorption of minerals and other nutrients”. Laminine naturally results in better physical, mental, and emotional strength. A study was designed to ascertain the effect of Laminine in regulating normal cortisol levels in the body. The result was significant in terms of proving that Laminine can affect the stress hormone – cortisol. Overall, study participants’ cortisol levels were down-regulated by an average of 23.7 percent. In general, the cortisol levels were regulated within the normal range after twelve days of taking the supplement. The cortisol level rises gradually over time and continues to climb as we age. Continued exposure to high levels affects the mood and physical being of a person and supplements will help regulate it. As presented in Table 3a and 3b, women in this study showed a greater response to Laminine than men. The eldest group saw a 37.6 percent normalization in cortisol levels compared to the pre-test levels. 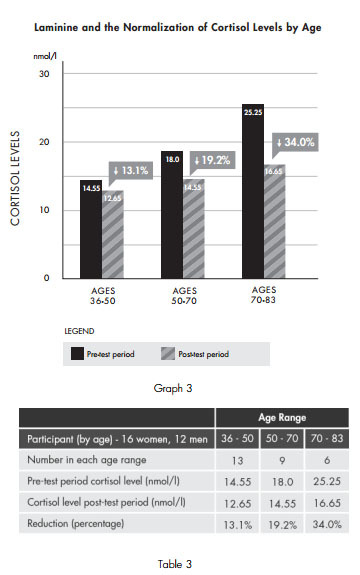 Compared to men in the same age group, the normalization of cortisol was 29.7 percent. Subjects in the younger age group experienced no significant differences when looking only at gender. Even subjects in the youngest age group saw a down-regulation in their cortisol levels during the course of the study. The Fertilized Avian Egg that contains FibroBlast Growth Factor or FGF stimulates the natural Dehydroepiandrosterone (DHEA) found our body. DHEA is the most abundant circulating steroid inside the human body. It is produced in the adrenal glands, gonads, and brain. DHEA has several effects in our body such as binding to cell surface receptors and acting as a neurosteroid. The end result is it reduces our physical and mental stress. Cortisol is a hormone released in our body when we are stressed and prolonged exposure to it can accelerate the aging process. A few of the problem a person has such as impaired cognitive, blood sugar imbalance, heart problems and even abdominal fat can be attributed to an increased and prolong exposure to cortisol. It may also affect bone density and slows healing of the wound. The opposite happens of course when a person has more of the “happy hormone” and less of the “stress hormone”.